With a federally-funded beach and dune building project the object of countless delays that have taken years, one Lavallette resident urged the borough’s governing body at a meeting Monday to consider taking the project on as a town. Mayor Walter LaCicero, however, said such a project would be a waste of money since, eventually, the U.S. Army Corps of Engineers’ project will be completed. John Corney, a Newark Avenue resident, told officials, “We have to protect what we have,” predicting the federal project could be delayed for the long term. The project, under which 22 foot-high dunes and at least 200 feet of beach berm would be engineered on beaches up and down the island, has been delayed as oceanfront homeowners have taken legal action to prevent the project. Others have refused to sign easements allowing the work to commence, leading municipalities to have to initiate eminent domain proceedings. In the absence of spending hundreds of thousands of dollars to truck in sand, as Toms River officials have done in Ortley Beach, LaCicero said the borough’s sole option is to install snow fencing along the eastern dune line, which has the capability of catching sand and expanding the dune. Councilman Robert Lamb said the borough’s public works department would install snow fencing by the end of the month. With the beach having been shortened by winter storms, officials have been wary of restoring the fencing too early, fearing it could be affected by high tides taking the wood out to sea. “Within the next week or two, you’ll see that snow fencing,” said Lamb. 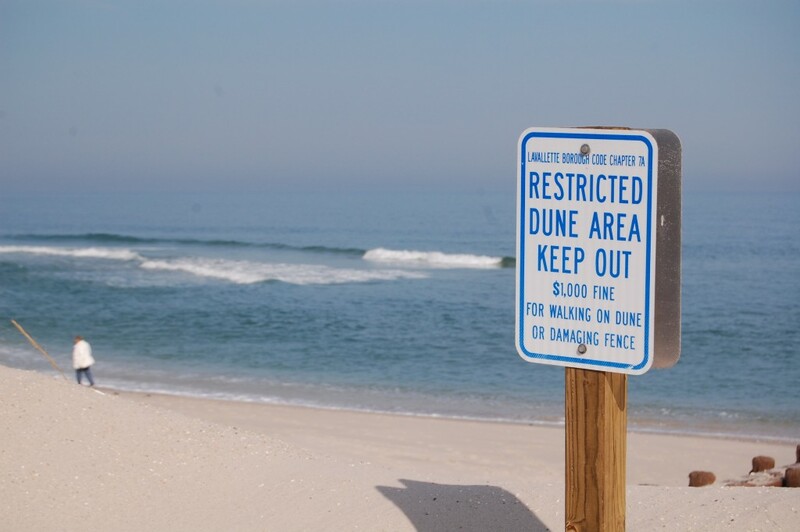 LaCicero said the borough is planning to request that sand from a planned dredging of Lavallette Channel in Barnegat Bay – which runs between Ortley Beach through Ocean Beach – be used to build up the borough’s dunes and beach berm. “We have to get their permission to do it, consent to give it to us, and then we have to get them to move it,” the mayor said. Lavallette previously was able to obtain reclaimed sand dredged from the bay after Superstorm Sandy, but the borough was responsible for paying for its transport to the oceanfront, LaCicero said.